Quantum computing is heralded for its potential to tackle problems that today’s conventional computers can’t handle. Scientists and industries are looking to quantum computing to speed advancements in areas like chemistry or drug development, financial modeling, and even climate forecasting. To deliver on quantum computing’s potential, Intel initiated a collaborative research program in 2015 with the goal of developing a commercially viable quantum computing system. While there’s been significant progress, quantum computing research is still nascent. The industry is at mile one in a marathon, and to realize this new computing paradigm, many problems must be solved and many architectural decisions must be made. For example, it’s not yet clear what form quantum processors (or “qubits”) will take. That’s why Intel is placing two major research bets and investing in them equally. One possible form is superconducting qubits. Intel is making fast progress in developing this type of test chip, which others in the industry and academia are also pursuing. Additionally, Intel is researching an alternative structure, which draws on the company’s world-class expertise manufacturing silicon transistors. This alternative architecture is called “spin qubits,” which operate in silicon and could help overcome some of the scientific hurdles to take quantum computing from research to reality. What is a spin qubit? Electrons can spin in different directions. When the electron spins up, the data signifies the binary value 1. When the electron spins down, the data signifies the binary value 0. But, similar to how superconducting qubits operate, these electrons can also exist in a “superposition,” which means they have the probability of a spin that’s up and down at the same time and, in doing so, they can theoretically process tremendous sets of data in parallel, much faster than a classical computer. Among the challenges researchers must overcome before quantum computing can become a commercial reality, is the incredibly fragile nature of qubits. Any noise or unintended observation of them can cause data loss. This fragility requires them to operate at extremely cold temperatures, which creates challenges for the material design of the chips themselves and the control electronics necessary to make them work. Superconducting qubits are quite large and they operate in systems the size of 55-gallon drums, which makes it hard to scale up the design of the quantum system to the millions of qubits necessary to create a truly useful commercial system. What is the status of spin qubits research? This week at the American Association for the Advancement of Science (AAAS) Annual Meeting, QuTech, will present on its success creating a two-qubit spin-based quantum computer that can be programmed to perform two simple quantum algorithms. This development paves the way to larger spin-based processors capable of more complex applications. You can read more in a related Nature article, which published today. And, Intel has invented a spin qubit fabrication flow on its 300 mm process technology using isotopically pure wafers sourced specifically for the production of spin-qubit test chips. Fabricated in the same facility as Intel’s advanced transistor technologies, Intel is now testing the initial wafers. 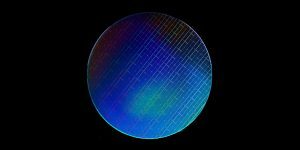 Within a couple of months, Intel expects to be producing many wafers per week, each with thousands of small qubit arrays. Going forward, Intel and QuTech will continue research on both superconducting and spin qubits across the entire quantum system – or “stack” – from qubit devices to the hardware and software architecture required to control these devices as well as quantum applications. All of these elements are essential to advancing quantum computing from research to reality.